One of the peppers in the Family of 4 Garden you are probably used to seeing in the grocery store by now, but not in the local garden center. That pepper is our ‘Yummy’ Snack Pepper. No, I’m not talking baby talk at you. The variety name actually is ‘Yummy’. You have probably seen snack peppers like this in plastic clamshell containers being sold for $3, $4, or $5. 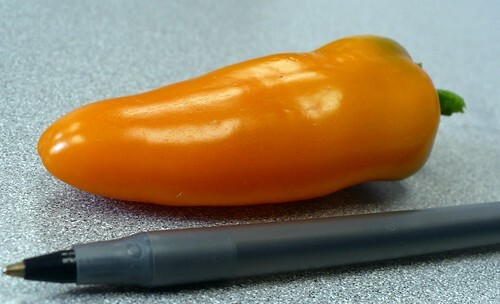 Our plant obviously produces orange peppers, but you can also get ‘Yummy’ varieties that are yellow and red. If you want to buy the seeds, you can get them from Totally Tomatoes for a small packet (15 seeds) or Seedway for a huge packet (100+ seeds). We’ve already gotten 3 peppers off our single plant, so the $2.95 cost of seeds is well worth it, especially when you think about the price in the grocery store! Posted on July 7, 2010, in Around the Garden, Family of 4 Garden and tagged peppers. Bookmark the permalink. Leave a comment.